Become an instant expert on knights. 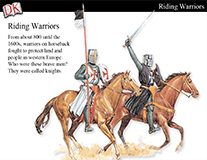 Find motivational mini-lessons and the reference material you need to introduce students to knights—the term used to describe the brave warriors on horseback who fought in western Europe from about 800 to the 1600s. Use this slideshow to introduce students to knights—the term used to describe the brave warriors on horseback who fought in western Europe from about 800 to the 1600s. 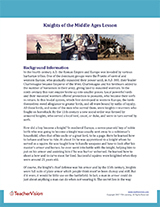 In this mini-lesson, students will learn about some of the milestones required to become a medieval knight and the duties required of the position.